Some pioneering market gardeners and farmers are reviving small scale market gardening to optimize the productivity of small spaces. There is great pressure on land. 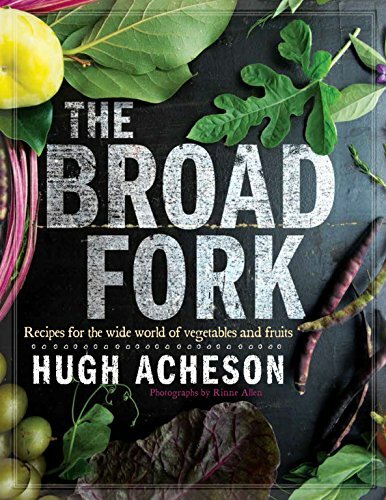 In my own United Kingdom prime agricultural land has reached prices higher than ever, and while marginal land is cheaper, it does not come at a price that many can pay or in places where many can find accomodation. Land pressures are further intensified by the need to construct houses, scandalously neglected by successive governments. In situations like these growers who can make the most of a small space are the ones who will be successful and who offer a pathway to the future. "Cultivate the smallest possible amount of land, but do so excellently." This was the motto of the Marachers, nineteenth century French market gardeners, whose meticulous precision and devotion to the highest standards of horticulture produced enough food for themselves, for their Parisian markets and a surplus for export to England, whose burgeoning capital, London, sucked in agricultural produce from not only Britain, but other lands. The marachers are gone,swamped by the undercutting pressures of big producers and a century of two major wars, but not they are not forgotten and as the world swings towards the need for more intensive production, their time is coming again. The concept of bio-intensive agriculture [and horticulture] began to develop again in California in the 1960s when John Jeavons, who had a microfarm, began to promote it again.Jeavons' agriculture is based on veganism, but bio-intensive agriculture does not have to be, and later on we will see that it is a system that can include animals. Jeavons system included double-dug raised beds,a feature that might run contrary to the modern idea of no- dig gardening, but like all bio-intensive systems it places great store by compost produced on the farm. However, Jeavons grew compost crops, which he called carbon farming, and while this obviated the need to purchase compost, it ensured that fewer crops were produced on the farm than would have been the case were compost brought in from outside. While sustainability is vital, it is the whole system that must be self-sufficient rather than each individual farm. If food is being sold out of the farm, resources are being lost and so must be replaced from outside. The system works on the maximum usage of land, so bio-intensive agriculture applies the principle that crops, which are companion-planted where possible, should be so closely spaced that at three quarters of their growth their leaves should touch. La Ferme du Bec Hellouin. 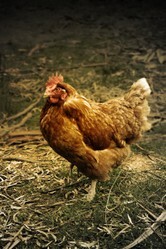 I have just said something about La Ferme du Bec Hellouin, which means the Farm at Hellouin Brook. It is situated in Normandy in Northern France, where its owners Perrine and Charles Herve-Gruyere farm a few acres in a small valley bottom. The couple both gave up good careers to farm the land in a self-sufficient, ecologically harmonious way, and Perrine took the trouble to go to England for a course in Permaculture, which many of you know is a system that rests upon making the maximum use of resources and energy before they are lost to the system.But after a while they began to realize that self-sufficiency can be a form of selfishness, so they decided that they ought to produce food for consumption by other people, so they developed into microfarming for the food market and began employing labour. The most efficient use of nutrients is combined with a strategy to obtain Spring crops. They have five hundred square metres of polytunnels, known also as hoophouses, which contain hotbeds. These have a base layer of unrotted, but rotting manure, which gives off heat to warm the Spring crops, over which there is a layer of compost. When the heat has died down the now rotted manure is applied to the soil. Building up the fertility of what was low fertility pastoral land has been a key ingredient of the success of the farm. They believe that if you take care of the soil, any plant will grow. Maybe, as long as it is in a climate zone suited to it. Like all operations inspired by Permaculture there is a forest garden. But there are also raised beds, a flock of sheep, some chickens kept for eggs and a pair of pigs, wich obviously are kept for meat. 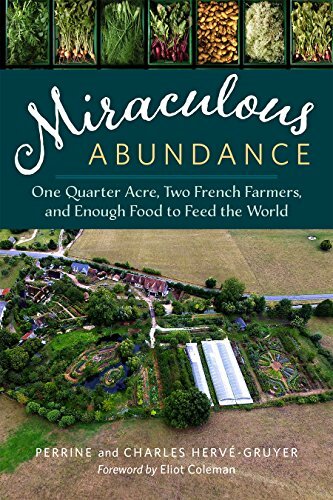 The farm works with other institutions, co-operating with Inra, a French research institute, by setting aside a quarter acre to ascertain whether it was possible for one person working without power tools to make a living on a quarter acre. This research, which took place over forty months, was successful. They also take students for training, which shows that successful small operations benefit from working with the wider horticultural/agricultural world. Inspired by La Ferme du Bec Hellouin Jean-Martin Fortier and his wife Maud-Helene farm one and a half acres in Quebec. They have developed a model in which they adapt to the climate of Quebec by the use of polytunnels [hoophouses] and various kinds of protection against the harsh climate in which they live. Their model relies on community supported agriculture, in which they sell shares in their produce to local families, who in return receive a box of vegetables each week. This is not a vegibox scheme, for the recipients are shareholders in the farm. Their scheme also differs from the Herve-Gruyere's scheme as it shuts down for a few months a year in the Canadian Winter, but it makes enough profit to see its owners through the Winter season. Much that can be said of this farm can be said of its inspiration, but the name Grelinette is significant, as it refers to a very useful garden tool, the Grelinette or Broadfork, which you see in the pictures. 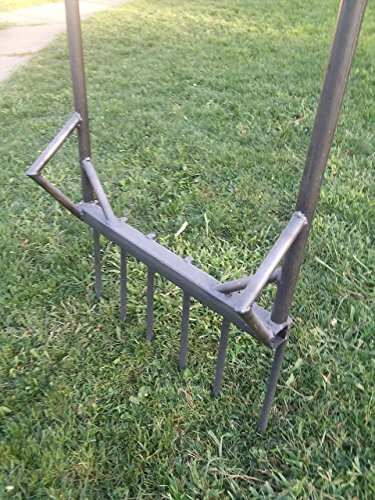 This is not a digging tool, but is used for aerating raised beds. 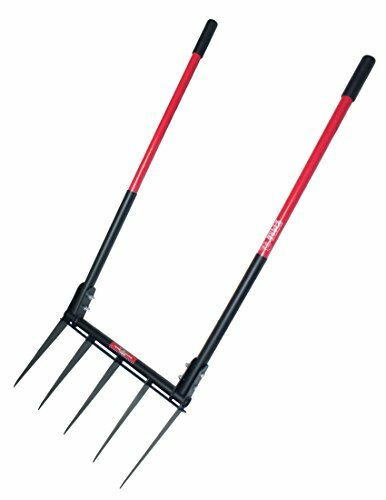 So it is akin to a tining tool, which you use to allow oxygen into the soil by making holes. It saves the grower the energy of digging over a bed, and is designed ergonomically to save the energy and the back of the one who uses it. Fortier also uses a two wheel tractor. In this he differs from Herve-Gruyer, who avoids tractors as he believes that while they cultivate far faster than a person working by hand, they do so in less detail and with less efficiency. The two wheel tractor uses an engine, but is designed to be used by one working on foot. The two wheel tractor has a number of attachments comparable to a normal tractor, and has the advantage that it can be used to till the earth to a shallow depth, which prevents the disturbance of the lower soil which causes the soil damage that is associated with the deep tilling done by a conventional plough. In the use of this machine he differs from Herve-Gruyere, who prefers as far as possible to use a horse for farm work. Of course a horse is more useful for working among the trees of a forest garden than a tractor is, and it is better for working on slopes than a tractor ever can be, as tractors can topple on slopes, whereas a horse does not. I began by talking about land pressures in Britain,but one must say that we are not the only country with these difficulties. But as food pressures rise the world will find that it needs growers who will be able to make the most produce from the least land. But countries will need land reform to ensure that land becomes available to those who will use it intensively for the public good. We need economic reforms to support them. We also need what we lack in the UK, politicians in government with the vision to see what is needed and the courage to work for it against vested interests. Bio-intensive agriculture is necessary for the future feeding of humanity. The small farms that I have described above are beacon in a gathering food storm that will beset all countries. I had heard the term, but did not know much about it. Thanks. lingustic nuance, for the Scots used to call a garden a kaleyard, so yard in Scottish usage could denote a garden. Whether this usage continues today I know not. Frak, I just recalled the man behind square foot gardening's name. It was Melvin. 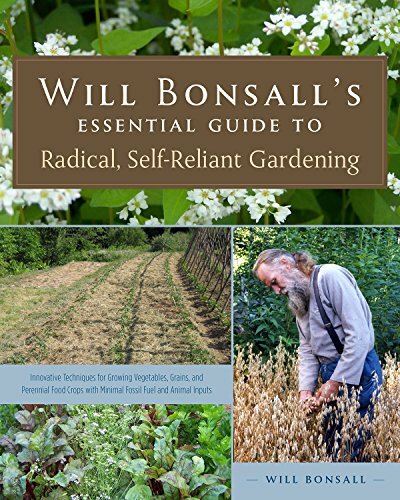 About 30 or more years ago an engineer named N+Bartholomew, I cannot recall his first name, wrote a book and promoted on television a concept called square foot gardening, where one makes square feet areas in the form a=of a grid. Then one would plant each square foot with whatever one wanted, with the constraints of not shading plants needing sun, nor allowing pollen problems for plants that can cross over. So, one square foot might be beans, then three more might be squash, then another could be onions, and so on. Of course I would not plant corn in from=nt of tomatoes. He had charts for spacing and the number of each type plant for a square foot. This is yet another use of small plats of land. In the U. S. a backyard refers to the area behind the house, or on the opposite side of the house from the street. It is used in urban and suburban places, where houses occupy most of the width of the land. In my area homes are often set 20 feet back on a 50 foot by 100 foot lot, and 5 feet need be not built on for the sides, as a fire protection. So, a typical home s about 40 feet across with a 50 or so foot depth, and the remaining 50 by 50 space, paved or not, is the back yard. Apparently this is another distortion of the english language we have done as a nation. In rural areas it would be a much larger plot of land, and perhaps the area immediately behind the house might be called a yard if it served the family for recreational use. Brilliant! I love what you say. You mention a back a backyard.In Britain when we speak of a backyard we speak of a paved space. Is such a space what you mean? I have an allotment, but no garden at home. Excellent! I remember the days when some city folk (often immigrants) turned the backyard into a garden and produced a lot of their own food. I hope we bring those days back, as well as encourage lots of local market farms. Where I live, I think we have a vibrant food-production community. Land is getting chewed up for development, but not all of it. 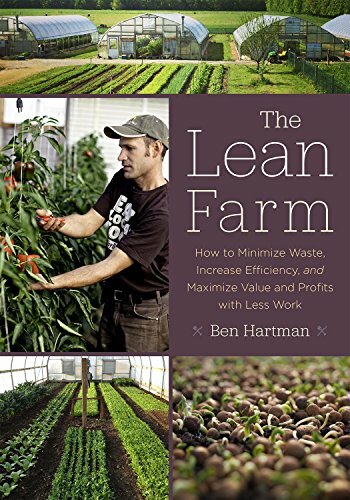 The gentleman who wrote the Lean Farm book is within easy driving distance, and I hope to see his new place in the spring (he's moving his farm from one side of the town to the other, actually making it closer to me). Germinating hybrid and heirloom tomato seeds indoors is much easier than you may believe, using this simple inexpensive seed starting method.